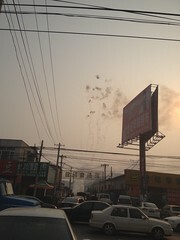 I got off the bus, on my way to the warehouse one morning, and was greeted by fireworks right before me. At 8am in the morning. Daytime set off fireworks for what? You can't see anything at all against a sun-lighted back-drop what?! We have been getting these fireworks every other day recently. Either someone is getting married or some company shifted in an started business that day. What I don't understand is why don't they use the traditional fire crackers (鞭炮) instead? It's louder and most certainly cheaper. My staff took a stab and guessed that it is to show off that they can afford fireworks instead of the cheaper fire crackers. Also, like a distress flare, people will be able to see where they are. My guess is that with fire crackers you will need to clean up since all the debris will remain whereas all the remnants from the fireworks goes somewhere else as they drift away into the sky and it'd be someone else's rubbish to clear.